Coastal cities are becoming more and more expensive. It’s not uncommon in New York or San Francisco for residents to spend 60% (or more) of their income on housing. We continue to see many people looking for dynamic cities with a lower cost of living. Austin has been welcoming transplants for years and that influx doesn’t seem to be slowing down. Austin is a big city (with plans to be a bigger city) with a growing urban center, high paying jobs and a vibrant community of like minded people. And, Austin is no newcomer to “best of” lists. Recently, it was named Best Places to Live in the US in 2018 by U.S. World and News Reports, Best City for Millenials, Best Tech City on the Planet and America’s Next Boom Town just to name a few. WalletHub, a personal finance website, recently came out with their Best Big Cities to Live In. You can read the full article here. Last year Austin made the list at #6 and this year saw a 3 spot rise. As our urban center expands, more high paying jobs move into the area and housing remains stable, it is no wonder Austin is climbing up the ladder. It’s amazing when you consider not long ago, Austin was a college town with a small town feel. 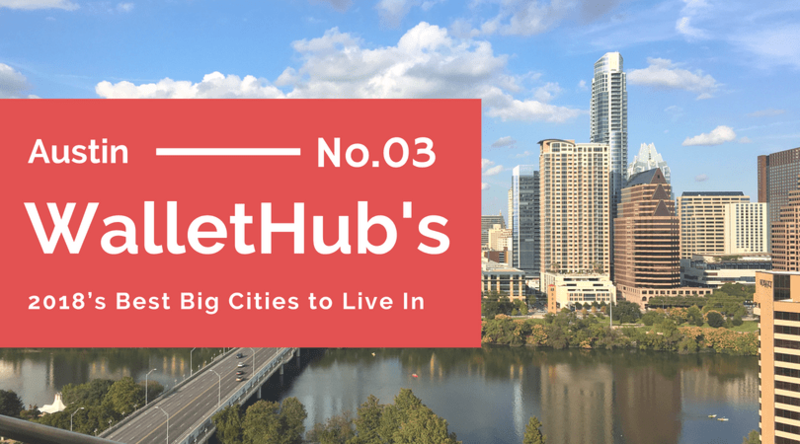 Though it definitely has some growth before it becomes a true large city with a vibrant and varied urban core, Austin is well on its way to becoming that. What Other Cities Made the Top 10? Austin (3rd), Arlington (31st), Fort Worth (32nd), El Paso (33rd), San Antonio (39th), Corpus Christi (42nd), Dallas (50th) and Houston (52nd) were all in the top 60. Texas has seen a tremendous amount of growth in the past decide, and not just in the big cities. You’ll see cities like El Paso and Corpus Christi climbing the ladder too. Not only are jobs pouring into Texas, but Texas is welcoming transplants with open arms and they are coming for the lower cost of living and higher quality of life. WalletHub looked at affordability, economy, education, quality of life and safety. They have some interesting stats on highest and lowest cities for housing affordability, homeownership rate, population of those living in poverty, highest income growth, highest percent of population aged 25 and over with a high school diploma or higher, highest percent of insured population, most restaurants per capita, most coffee shops per capita, best walk score, best bike score and lowest crime rate. Austin is no longer a secret, so if you’re looking to relocate, now is a great time to check it out. We’ve helped hundreds of families relocate to the area. We know moving to a new city is a monumental task, especially if you aren’t familiar with it. With some information about what you’re looking for, we can show you where you might be able to find that in Austin. If you’re considering relocating, check out our Austin Relocation Guide and our Austin Relocation Blog for some great tips on getting the process started. Then, when you’re ready to talk to one of our Austin relcoation specialists, call us at (512) 827-8323, email us at info@11OaksRealty.com or fill out our Relocation Survey to schedule a no obligation consultaiton.